To purchase this book, you may click on the button above and you will be connected to PayPal where you can use your PalPal account or charge your purchase to your Visa or MasterCard. 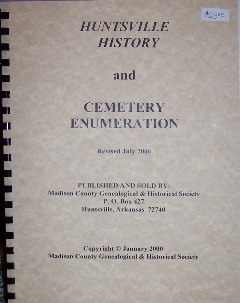 Or, you can send a check in the amount of $28.00 to the society requesting the Huntsville History and Cemetery Enumeration. "War Eagle was the first community in Madison County to obtain the acknowledgement as such. . . . War Eagle was located on the post road that ran between the two court houses of Washington and Izard Counties in the Arkansas Territories." "The southern part of the town site was originally entered by George W. Sanders, by whom the first house was built. . . Thomas McCuistian was employed to survey and lay off the public square . . ."
"The original town square was much smaller than the present day square. . . Joel D. Blair, of Fayetteville, built the first house in the town proper, and opened the first store on the northeast corner of the square. . .There were three "groceries" drinking saloons, in the present terms used to denote that business, of which Reuben Harper, Jonas Bevins and B.F. Payne were proprietors. The population in 1850 was . . ."